HOW TO REDEEM YOUR CAR FROM A NYC IMPOUND LOT | I wanna love You better whatever it takes . . . Okay. I tried to keep this in the same format as my previous post, but it’s not working for me. so here goes: After having realized that the car was just not there, we returned to Max and Tim’s apartment and visited this friendly website. Well, first I had a debate with Max about whether or not it would work for me to dial 311 on my cell phone . . . but I was too chicken to try it, for fear that it would cost me $1.75. After trying not to faint at what it was going to cost me, I set out on the bus with Max to the Brooklyn Navy Yard. Upon entering the compound, I was faced with a complicated series of instructions on how to proceed. First, go to the office, wait on the grey line (even though there was nobody else there! ), get paperwork from the friendly counter person, surreptitiously take said counter person’s picture with your cell phone when he’s not looking so that you can blog it later (oh wait. that one wasn’t THEIR instruction! ), then go to your car with that piece of paper to get your registration and proof of insurance. Of course, I was not permitted to simply walk to my car. I had to get into The Van. And when Max tried to come along, we were told, “Only one person in the van.” (in case we wanted to try to steal someone else’s towed car?) 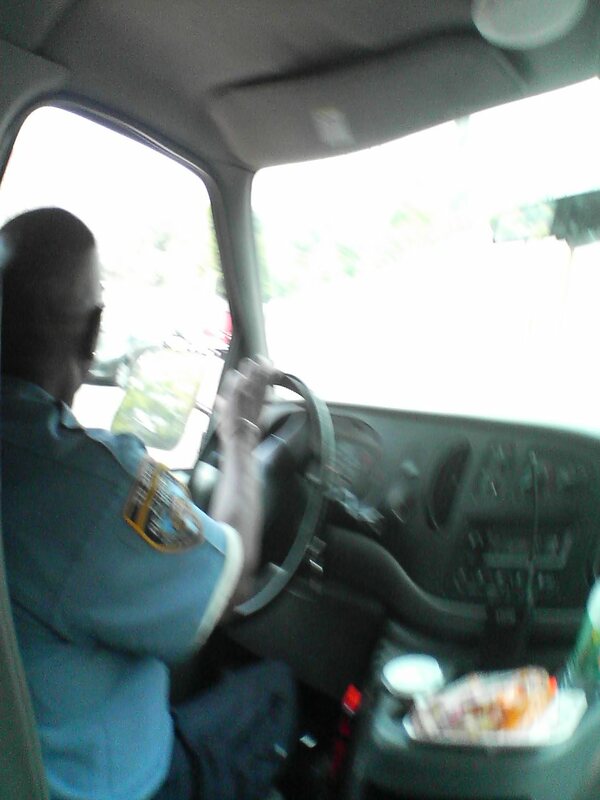 Of course, I took a picture of my friendly driver as well . . .
Then it was back to the office with my paperwork. Happily, I had been told that I didn’t have to wait in line when I got back, so I gladly went right up to the window, ahead of all of the zero people who were waiting. Such efficiency! Such service! We continued the lovely transaction. Of course, at this point I needed to have Max step in and help me out, as I was not in possession of the large amount of money that was needed. soooooooo . . . now I owe Max some money. I shudder to think what would have happened if I didn’t have wealthy friends! ← I know you’re dying to hear about my trip to the Brooklyn Impound Yard . . .
several hundred dollars . . . sorry, I honestly can’t remember anymore . . . and then there’s the ticket that you still have to pay.